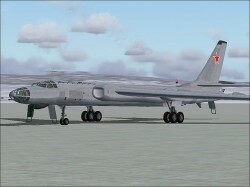 Description: The famous Cold War veteran is depicted in three variants - the early 'Badger-A' strategic bomber, the 'Badger-G' with its two underwing AS-5 'Kelt' stand-off missles (in Egyptian AF camo scheme), and the 'Badger-C Mod' with the typical single underwing AS-6 'Kingfish' cruise missile and the unusual nose radome. A low-poly version of the A variant is also included for AI use, and the G and C variants can also be flown 'clean'. The detailed virtual cockpit has the usual range of animated parts and also includes the bombardier's section on the A and G variants. The exterior model has bare-metal reflective textures (not G) and features an opening bomb bay and three opening crew hatches with ladders (2 on C). The 2D panel is fully mousable and has subpanels for starting, radios and autopilot. The flight model is very authentic - beware, the Badger needs a long runway to get airborne ! There is also an optional advanced flight model which requires more user intervention in terms of fuel management and trim and represents a greater challenge.